You waited, you hoped and you prayed, but now it's official, there is a Fashion's Night Out Tote to go with the Tee shirt. The souvenir machine is in high gear now. Brahmin, the luxury New England handbag company, created this limited-edition tote exclusively for the event on September 10, 2010. 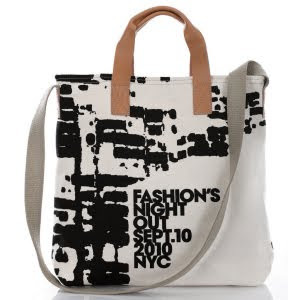 The good news is the bag is good looking and a portion of the sale proceeds will go to benefit the NYC AIDS Fund. The limited edition Brahmin FNO tote will be sold for $45 at Brahmin retail locations, online at Brahmin.com, and at participating FNO retailers including Henri Bendel, Bergdorf Goodman, BergdorfGoodman.com, Bloomingdales, Bloomingdales.com, Lord & Taylor, Macy's, NiemanMarcus.com, Nordstrom, and Saks 5th Avenue beginning on August 30 until supplies last. Five dollars from the sale of each bag will be donated to the NYC AIDS Fund. What do you think readers? Is $45.00 a fair price for the tote?